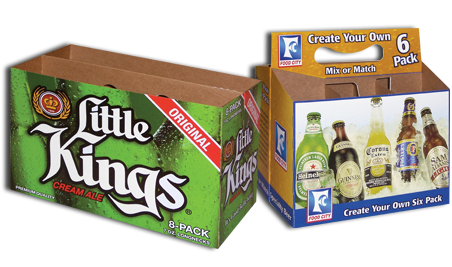 NEPA is your one stop source for beverage carriers and cartons. Standard Reverse Tuck (SRT) The standard reverse tuck has the manufacturer’s joint in the right rear corner. The top closure tucks from the rear to the front, and the bottom closure tucks from the front to the rear. The standard straight tuck is particularly well suited for products requiring a large window in the front display panel. Typically, both closures will tuck from the front to the rear, which avoids a raw edge showing at either end of the primary display panel. It also prevents possible interference between the tuck and the window film material, which could occur with a reverse tuck. . this style is equally well suited for hand erecting and closing, or machine forming and closing. The full overlap seal end (FOSE) is typically erected, filled and closed on automatic horizontal or vertical packaging equipment. The normal closing sequence is: Dust flaps in first, inner closure panels (off the rear panel) down next, and outer closure panels (off the front panel) down last (Figure 2). The sift resistant characteristics of the FOSE may be enhanced by making minor changes to the design and folding sequence of the end closure and flaps. This style originally identified by the inventor’s name (Houghland) is today for frequently referred to as the 1-2-3 closure. It is used almost exclusively as a bottom closure, generally in combination with a tuck top closure. This is a hand erected and closed style. In addition to use in the variation shown below, the 1-2-3 closure is frequently used as the bottom closure for a shallow depth tube style counter display carton. The Himes or crash lock automatic bottom is preglued in the converter’s plant. It is hand erected and typically used where fast set up is critical, but production volume does not justify an investment in automatic packaging equipment. The Beers tray is glued by the converter and shipped flat to the customer. It is typically set up and loaded by hand. Figures 1 and 3 show the conventional Beers. Figure 2 shows the “stay-up” or “full drag” version. Combination of a side panel diagonal angle of less than 45° (43-1/2° typically) and a non-tapered glue flap causes the glue flap to “drag” across the bottom panel. Natural friction causes the carton to resist collapsing once erected. This style is typically set up, loaded and closed by hand. It is suitable for a broad range of relatively light products. View the PDF on the right for product specifics. The six corner Beers tray is glued by the converter and shipped flat to the customer. It is typically setup and loaded by hand. A variation on this basic style includes conventional Beers corners at the front of the base tray and front cover.